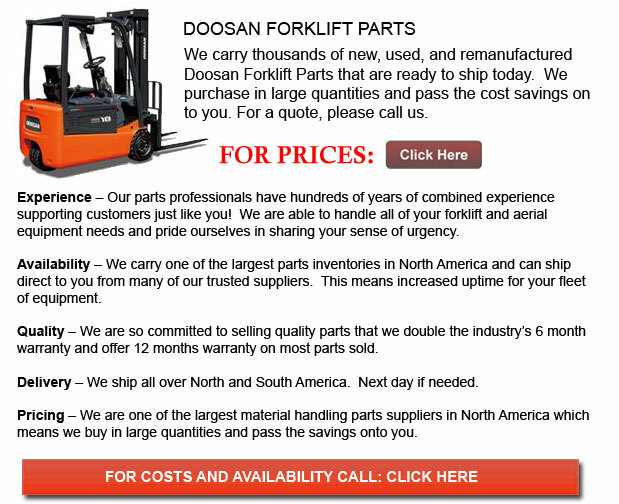 Doosan Forklift Parts - Doosan Infracore Company Ltd. is an intercontinental establishment consisting of Diesel Engines, Defense Industry goods, Industrial Vehicles, Construction Equipment and Machine Tools and Computerization Systems. In the United States, Doosan Infracore America Corporation is headquartered in Suwanee, Georgia. It is home to a 170,000 square foot manufacturing facility, which is the home of the Compact Equipment and Construction department. West Caldwell, New Jersey is home to the Machine Tool division and Cleveland, Ohio is home to the Forklift division. The U.S. headquarters in Georgia facilitates a first rate parts operation capable of supplying an excess of 25,000 line items to support Lift Truck, Compact Equipment, Machine Tool and Construction client wishes. There are well over 220 Doosan service and sales locations operating in Canada and the United States. Additionally, there are more than 90 independent dealers moving lift truck materials and materials handling equipment. This system helps Doosan Infracore America to aggressively compete in this competitive marketplace. The forklift product line remarkably includes 63 distinctive versions consisting of 82 various battery and engine configurations of Electric-powered and Internal Combustion forklifts. Capacities of these various truck designs range from 3,000 to 33,000 lbs. All vehicles are manufactured in an ISO 9001 qualified facility. Doosan Infracore America is the fastest developing forklift and lift truck corporation in the North American market, due to its excellent level of product performance and their persistently high level of customer support and service given to all Doosan Infracore Forklift clients. The U.S. lift Truck division stationed in Cleveland has a expert team knowledgeable in Sales, Purchasing, Marketing, Logistical and Technical Support. Korea's initial domestic forklift marketplace was an open-import enterprise. In the 1960's, Korea Machinery Co. Ltd. started to import assembled forklifts as part of a national machinery expansion venture. Initial product sales of this industrial equipment focused on large business groups, the armed forces and on state-run firms. This ultimately led to a merger with Daewoo Heavy Industries Ltd. In 1976, the Forklift Division commenced business operations throughout Korea to overhaul and sell this heavy equipment. By 1978, a lift truck manufacturing plant was successfully completed. Continuous technical instruction became the new focus for improving quality and product development. Domestic forklift business for Daewoo started in 1967 and grew to an amazing 90% market share in Korea. By the 1980's, Daewoo's progressive technological advancements combined with sales success placed them in a situation of significant growth of their forklift operations. Caterpillar Industrial Inc. of the U.S. in 1981, proposed a joint venture project to assist them in the highly competitive North American materials handling industry. This joint-venture proved highly successful for Daewoo and their lift truck product sales expanded greatly. In 1984, the company completed construction of a new facility to help in manufacturing high end value-added goods for export. In 1993, the corporation had a international sales network and started exporting designs they had developed through in-house expertise, as an sovereign brand. Certifications were then acquired from CE of Europe, UL of the United States and ISO 14001 and ISO 9001, securing growth opportunities into international markets.